Many of the most spectacular astronomical objects are found in the southern skies. With this up-to-date, superbly illustrated handbook, both the amateur with binoculars and the expert with a telescope can make discoveries about new and interesting objects. Professor E. J. Hartung first produced his comprehensive and highly respected guide in 1968. Now the book has been greatly expanded and thoroughly revised, enhancing its character as an indispensable information source. With over 150 illustrations, new material is included on constellations and celestial coordinate systems as well as more modern descriptions of stars, nebulae and galaxies. The authors have included a new "southern Messier" list of objects. The authors' passion for their subject make this a unique and inspirational book. Many of the beautiful photographs were taken by David Malin, the world's leading astronomical photographer. The result will fascinate active and armchair astronomers alike. 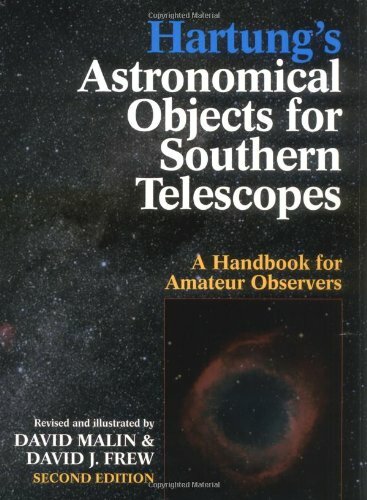 Up-to-date and superbly illustrated, Hartung's Astronomical Objects for Southern Telescopes enables both amateurs with binoculars and experts to discover the spectacular astronomical objects in the southern skies. Hartung's original 1968 guide is greatly expanded and thoroughly revised, with over 150 illustrations, new material on constellations and celestial co-ordinate systems, modernized descriptions of stars, nebulae and galaxies and a new 'southern Messier' list of objects. With photographs by David Malin, the world's leading astronomical photographer, the authors' passion for their subject makes this inspirational book a delight to all observers. David Malin is the Photographic Scientist at the Anglo-Australian Observatory and is well known for his pioneering techniques in astronomical photography, a field in which he is internationally recognised as the world leader. In 1985 he was awarded the Jackson-Gwilt Medal of the Royal Astronomical Society and an Henri Chrtien award from the American Astronomical Society. He has produced many scientific papers and popular articles on astronomy and is the co-author of Catalogue of the Universe and Colours of the Stars. His most recent book, A View of the Universe, won the 1994 Eureka Prize. David Frew is one of Australia's best-known amateur astronomers and is a regular contributor to Sky & Space magazine. He holds a degree in Applied Geology and is a science teacher at a Sydney secondary school. Malin, David, Frew, David J.